SimCity: Cities of Tomorrow is an expansion pack released for SimCity (2013). The expansion includes several new futuristic buidings from the near future. 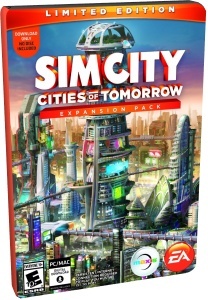 The expansion is fully compatible with vanilla SimCity players. *Requires SimCity base game to play. • Build into the Sky - Create towering multi-zone MegaTowers that allow your Sims to live, work, and play without ever having to touch the ground. • Corporate Consumerism vs. Green Utopian - Unlock two new city specializations that allow you to build a resource-hungry mega corporation powered by a low-wealth workforce, or an urban utopia that develops clean technology and is controlled by the rich. • Transform Tomorrow - Watch your city transform as it adapts to the changing times, with new options based on real-world technology such as Mag Levs that rise above the city streets and small buildings, futurized vehicles, and service drones. • New Disaster - Brace yourself for an all-new type of disaster only fitting a technologically-advanced economy: a giant robot attach on your city! To activate this DLC you have to own base game SimCity (2013) on your Origin account. 1. Launch the Origin client software and log into your Origin account. 2. Click the Origin Menu.